There is nothing better that a groomed dog in your house, but to keep it clean you have to bath them. 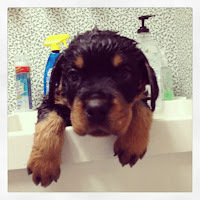 For some dogs it is easy since they enjoy being bathed, but for others it can be boring and very stressful. Here are some tips that teach you how to bathe a dog easily. 1. Start bathing your dog when he is puppy so bath time will be much easier later. 2. Help your dog learn to trust you through actions such as handling the ears, touching the paws, or opening his mouth several times a day. 3. Always use a good brushing comb to remove all dead hairs. 4. Always use a dog shampoo because using a human shampoo can upset the balance of a dog's skin. The pH of dog skin is very different from human skin. Human skin has a pH of around 5.5 to 5.6 while dog's skin has a pH of between 6.2 and 7.4. 5. Always be very careful not to get water or shampoo into your dog’s eyes and ears during the bath time. 6. Always make sure the water temperature is lukewarm to protect their skin and coat.